Today, I'm answering a reader's question about diagramming sentences that include direct quotations. Thank you for your grammar lessons. I have a diagramming question for you. 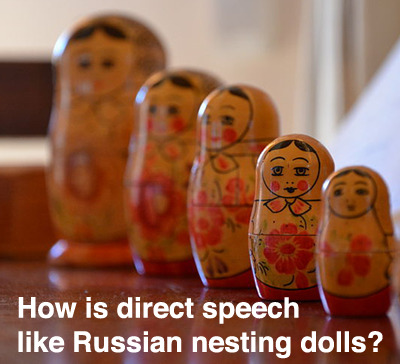 How do I diagram sentences with direct speech when the direct speech itself is a complete sentence? Thank you for your help. Here are two examples of what Robyn is asking about. 1. Bob yelled, "We won!" 2. Maria said, "I feel sleepy." Did you notice that in both of our example sentences, the quoted speech is a complete sentence? It's almost as if we have a sentence within a sentence! It reminds me of those Russian nesting dolls that fit inside of each other (Matryoshka dolls). Before we cover how to diagram our example sentences, we need to have a review of some relevant information, so let's review direct objects and noun clauses! Wahoo! Direct objects are nouns that receive the action of certain kinds of action verbs. We can find direct objects by asking What did (subject) (verb)? What did Karen kick? She kicked the ball. Ball is a direct object. It is a noun receiving the action of the verb kicked. What did James write? He wrote a paper. Paper is a direct object. It is a noun receiving the action of the verb wrote. Clauses are groups of words that contain a subject and a verb. Noun clauses are clauses that perform the job of a noun. Can you tell me what we are having for dinner? Whatever you want is a noun clause. It contains a subject (you) and a verb (want), and the whole clause is performing the job of a noun. It is subject of the sentence. What we are having for dinner is a noun clause. It contains a subject (we) and a verb (are having), and the whole clause is performing the job of a noun. It is the direct object of the verb tell. In both of our example sentences, the words within the quotation marks are noun clauses. They contain a subject (we and I) and a verb (won and feel), and they are both performing the job of a noun. Both of those noun clauses are acting as direct objects. We won is the direct object of the verb yelled. What did Bob yell? He yelled We won. I feel sleepy is the direct object of the verb said. What did Maria say? She said I feel sleepy. Let's look at how we would diagram these sentences. After all, diagramming helps us SEE the grammatical relationships among words in sentences. 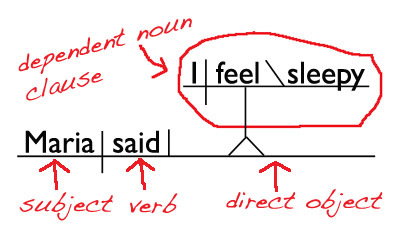 All sentences have at least a subject and a verb, so you'll always see this cross-looking thing in sentence diagrams. When you see it, know that the subject is on the left side of the cross and the verb on the right side of the cross. When the verb is the kind of verb that has a direct object, the direct object goes on the horizontal line after the verb. You remember that noun clauses contain a subject and a verb, right? Of course you do! I hope that you also remember that our noun clauses were both acting as direct objects in our example sentences. So, here we have the Russian nesting doll concept. Just pick up the cross that belongs to the noun clause and plop it into the direct object space in our diagram. Then, we attach it to the main horizontal line with a little tree-like thingy. There you have it! Here are the diagrams of our example sentences with direct speech. Can you identify the subject/verb lines in the diagrams? * If you're curious about the slanted line between feel and sleepy, you can check out this lesson on linking verbs.